Many germs spread in more than one way. Some are spread through the air, by contact with an infected person, through blood or body fluids, contaminated food or water, or by insects and animals. “Germs” is a common term used for bacteria, viruses, fungi and some parasites. Not all germs cause disease. Some germs even help us to stay healthy. Some germs can lead to infection or disease. A communicable disease is an infection caused by a germ that is spread from person to person, or from the environment to a person. The influenza virus can be spread in droplets in the air or by contact with a tissue that someone with the flu has used to blow their nose. Usually in droplets that are coughed, sneezed or breathed into the air by a person who is infected. Some germs such as the cold, influenza and mumps germs travel short distances. Others such as measles and chickenpox stay in the air longer and can travel longer distances. Some diseases need direct person-to-person contact with an infected person. In other cases, germs are spread by contact with an object that has germs on it. Some of the infectious diseases spread by contact are pink eye and impetigo. Infestations such as ringworm, head lice, scabies and pinworms also spread by contact. When those of an infected person enter the bloodstream or mucous membranes of another person. Some of the diseases spread in this way are HIV, hepatitis B and hepatitis C.
Food poisoning happens when food or water is contaminated. Rats, mice, flies, mosquitoes and more animals can carry harmful germs that cause illness. We cannot always tell when someone has an infection. 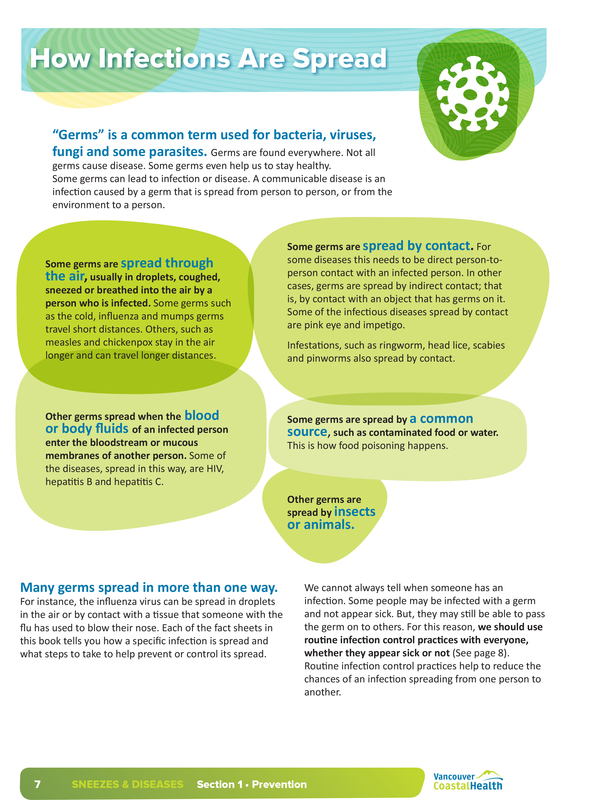 Some people may be infected with a germ and not appear sick but they may still be able to pass the germ on to others. For this reason, we should use healthy practices with everyone.